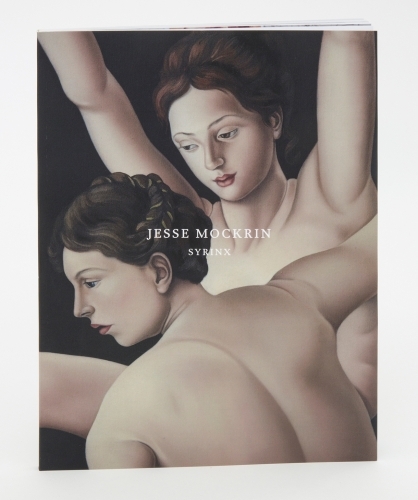 Night Gallery is pleased to announce the publication of Jesse Mockrin's Syrinx, a monograph documenting her solo exhibition of the same name. The show was on view at Night Gallery from December 1, 2018, through January 18, 2019. This catalogue provides insight into Mockrin's practice as well as the extensive research that went into her masterful series of works which quote and subvert paintings and etchings by Baroque, Renaissance, and Romantic artists. Included in the catalogue are an introduction by the esteemed Los Angeles painter Monica Majoli, an interview with Mockrin by curator Diana Nawi, and a critical analysis of Mockrin's project by Edward Sterrett, postdoctoral research associate at the Getty Museum. Images of the works and the exhibition appear alongside the source material that inspired Mockrin's series. For orders, please email info@nightgallery.ca. Jesse Mockrin (b. Silver Spring, MD, 1981) received her M.F.A. from the University of California, San Diego, in 2011, and her B.A. from Barnard College, New York, in 2003. Mockrin has had solo exhibitions at Night Gallery (Los Angeles), Nathalie Karg Gallery (New York), and Galerie Perrotin (Seoul). Her work was recently acquired by the Dallas Museum of Art, and her work is also in the collections of the Los Angeles County Museum of Art (LACMA), the Rubell Collection, the KRC Foundation, and the Hans-Joachim and Gisa Sander Foundation. Mockrin's work has been covered extensively, appearing in publications including Artforum, The New Yorker, Vogue, T Magazine, Modern Painters, and Art Agenda, among others. She lives and works in Los Angeles.